One of the specialties of AIDC is not only cutting and polishing rare colored diamonds to maximize color saturation, size and ultimately value, but also identifying undervalued pieces of diamond rough that have the potential to polish out at a high diamond grade and thus have significant add-on value to those interested in purchasing the rough for ultimate resale or for polishing in the future. The market for diamond rough measures at close to $15 billion, from just over $10 billion a few years ago. This is because the scarcity of quality diamond rough and the growing demand in polishing centers around the world continues to push prices higher as diamond sales around the world grow at a 5% – 7% annual level. AIDC holds regular sales of rough diamond tenders and auctions to qualified diamond dealers, brokers and private buyers to access our international base of diamond rough contacts and give access to acquiring some of the best gem-quality diamond rough from some of the most important mines in the world. The shapes are selected for having excellent quality of shape, inclusions, surface features and color. All rough diamonds have been purchased from legitimate sources not involved in funding conflict and in compliance with the United Nations resolutions and the Kimberley Process. 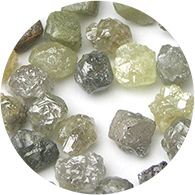 AIDC hereby guarantees that these diamonds are conflict free, based on personal knowledge and/or written guarantees provided by the supplier of the rough diamonds.